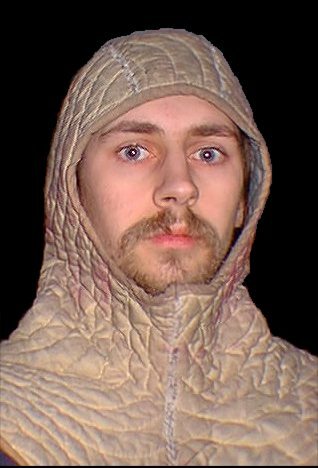 This is a padded coif I made to wear under a maille coif and early great helm. 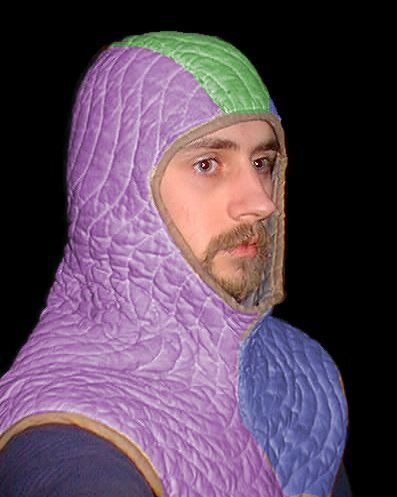 I like it so much that I've also decided to use it with the 16th century armor I am now working on. 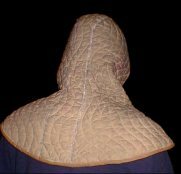 This one was made out of a quilted moving blanket and it not only takes some of the shock from being hit (when wearing a helmet over it) but it also does a great job of soaking up sweat. Sweating inside helmets is one of the reason they get stinky sometimes (come on, admit it, you've put on your helmet before and thought "euuuwww this thing smells! "), and having something to soak up the sweat will help stop that problem before it starts. So now you're prolly thinking "oohh, where can I get one of these wonderful things?". Well, if you have a sewing machine or know anyone that does, you could make one yourself. It's a fairly simple pattern consisting of three parts and I've made this page to help you figure it out. Below are some color coded pictures. 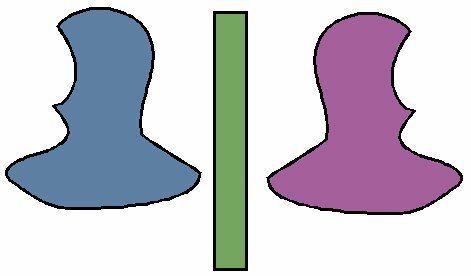 They are the same pictures as above but with the three parts colored different colors to show how they go together, and another picture to show the shapes that are involoved. It should be fairly simple to follow.